Catherine Grant will discuss the above companion piece to her video essay Touching the Film Object? at a workshop on “Video Essays: Film Scholarship’s Emergent Form” at the 2012 Society for Cinema and Media Studies Conference, 5pm on March 22, 2012 in Boston. Her fellow workshop participants will include Christian Keathley (Middlebury College), Girish Shambu (Canisius College), Benjamin Sampson (UCLA), Richard Misek (University of Kent), Craig Cieslikowski (University of Florida) and Matthias Stork (UCLA). One place where this ‘reinvention’ of analysis and revived cinephilia can be seen is in the emergence recently of a new scholarly form — the video essay. Practitioners of this form are exploring the ways in which digital technologies afford a new way of conducting and presenting film research — for the full range of digital technologies enables film scholars to write using the very materials that constitute their object of study: moving images and sounds. Examples of this video essay work can be readily viewed online, especially at the Moving Image Source website, and at the vimeo site Audiovisualcy . But most of the work in this new form is being produced by scholars outside academia (with some key exceptions), in part because the strictures of written academic discourse pose a challenge for this nascent form of multi-media scholarship. [H]apticity — a grasp of what can be sensed of an object in close contact with it — seems to me now to be very helpful in conceiving what can take place in the process of creating videographic film studies. It can also help us more fully to understand videographic studies as objects to be experienced themselves. In the old days, the only people who really got to touch films were those who worked on them, particularly film editors. As Annette Michelson (1990) and others have argued, the democratization of the ‘heady delights’ of editing (Michelson, 1990: 22) was brought about by the introduction of video technology in the 1970s and 80s. Now, with the relatively wide availability of digital technology, we can even more easily share ‘the euphoria one feels at the editing table […] a sharpening cognitive focus and […] a ludic sovereignty, grounded in that deep gratification of a fantasy of infantile omnipotence ” [Michelson, 1990: 23]. But, are there other ways in which ‘touching film’ is just a fantasy? In videographic film studies, do videographers actually touch or handle the real matter of the film? Or are we only ever able to touch upon the film experience? Our film experiences? Do video essays only make objects of, or objectify, our film experiences, our insuperable memories of them, our own cinematic projections? These questions may not flag up significantly new limitations. Film critical video essays do seem to work, it seems to me, in the same ‘intersubjective’ zone as that of written film criticism. As Andrew Klevan and Alex Clayton argue of this zone, ‘we are immersed in the film as the critic sees it, hence brought to share a deeply involved perspective’ (2011: 9). Yet, in videographical criticism, is there not a different intersubjective relation, a more transitional one, to the physicality or materiality of the objective elements of films that the video essays reproduce? Like written essays, video essays may well ‘”stir our recall”‘ (Klevan and Clayton, 2011: 9) of a film moment or sequence, but they usually do this by confronting us with a replay of the actual sequence, too. How might this difference count? If nothing else, this confrontation with, or, to put it more gently, this inevitable re-immersion in the film experience, ought to make videographic critics pursue humility in their analytical observations with an even greater focus, make them especially ‘willing to alter [their analyses] according to what [they come into] contact with […] give up ideas when they stop touching the other’s surface’ (Marks, 2004: 80). A further, built-in, random element in non-linear digital video editing — the fact that this process frequently confronts the editor with graphic matter from the film (e.g. thumbnails) that s/he may not specifically have chosen to dwell on — may also encourage a particularly humble, usefully (at times) non-instrumental form of looking that Swalwell (2002) detects in Marks’ notion of hapticity. As Marks writes, ‘Whether criticism is haptic, in touch with its object, is a matter of the point at which the words lift off’ (2004: 80). Haptic criticism must be what happens, then, when the words don’t lift off the surface of the film object, if they (or any of the other film-analytical elements conveyed through montage or other non-linear editing techniques and tools) remain on the surface of the film object, as they often do in videographic film studies. In addition to this, video essays on films may often be an especially ‘superficial‘ form of criticism, frequently using slow motion or zoom-in effects to allow those experiencing them to close in on the grain or detail of the film image. What interests me most in academic study is the exploration of what Gérard Genette called “transtextuality”, that is to say, “everything that brings the text into relation (manifest or hidden) with other texts” (Genette, Palimpsestes, 1992: 81). Sometimes this interest alights on matters of cultural influence and film authorship (see here, for example), but often it focuses itself on the issue of the recognition of cinematic interconnectedness. Here is the second entry in a mini-series of posts here at Film Studies For Free on the practical possibilities for, and the critical debates about, audiovisual film studies research and ‘publication’. Today the focus is on two of film scholarship’s emergent forms, much loved by FSFF: video essays on, or scholarly remixes about, film. The above quotations draw attention to the range of issues these forms raise for film studies: from the changes they involve in the processes of film studies research to the questions they pose about its publication forms and knowledge effects, as well as the possible roles for creativity and affect in our discipline. The occasion for this latest meditation is an upcoming workshop discussion at the annual conference of the U.S. Society for Cinema and Media Studies. But there are also a whole raft of online developments in, and other important, recent, publications on, this genre that FSFF wanted to flag up. Those are listed below. Beneath all the links you will find embedded versions of some of the online video essays by FSFF‘s very talented, fellow workshop panellists and respondents in Boston. (You can find all of FSFF‘s audiovisual essays here). If you are able to come to the workshop, hurray! Do please say hello to us all at the end! If you can’t come but would like us to discuss any questions you have about video essays, do post those in the comments below. Thanks. FSFF will take a little blogging break during and after the SCMS conference, but will tirelessly tweet during the conference, reporting on panels attended and other events. So do please follow @filmstudiesff if you’d like those updates. Otherwise, see you back here sometime in early April. Latest issue of Transformative Works and Cultures about remixes, vidding, and video essays (Vol 9 (2012) (thanks to Christian Keathley and Jason Mittell for the link). The issue was guest edited by Francesca Coppa, Muhlenberg College, and Julie Levin Russo, Brown University. Catherine Grant, ‘AUDIOVISUALCY: A New Press Play Column’, Press Play at Indiewire, March 15, 2012 A new bimonthly column in which Grant, Kevin Lee and guests discuss what they like and value about particular examples of online video essays about films. Critic and historian Charles Barr, in his 1976 article “Blackmail: Silent and Sound”, in which he closely compares the two versions, notes that the silent version shows Hitchcock striving to escape a ‘theatrical’ style in which the action is generally viewed face on, with the camera occupying the position of the ‘fourth wall’. In a theatre, this represents the position of the proscenium arch, which marks the boundary between a conventional stage and the audience. Although 1929 was rather late for a “first” sound film, the delay enabled Hitchcock to produce an advanced meditation on the possible uses of sound. The text incorporates silent footage (lifted whole from the original silent version, made immediately prior to the sound version), which allows for a series of comparisons/contrasts between sound and silents/silence. The conceit of this early sound film is an attempt to keep a man silent (paying off a blackmailer). The heroine spends over a third of the film virtually speechless. When she finally speaks, her boyfriend urges her to keep quiet. The dialogue is laughably banal, yet the right word can cut like a knife. The opening scene, an exciting silent chase, is immediately contrasted with a poorly dubbed, confusingly cut dialogue scene that seems as if it will never end. But before we glibly assume silents were “better” movies, sound becomes a moral force, while silence is linked with corruption and moral lassitude. Hitchcock first makes us aware that he is distorting the sound track subjectively when he exaggerates the loudness of bird chirpings to stress Alice’s agitation on the morning after the murder. When the mother enters Alice’s bedroom to wake her, she uncovers the cage of Alice’s canary. Once the mother leaves the room, the bird’s chirping is loudly insistent while the girl takes off the clothes she wore the night before and puts on fresh ones. The chirps are loudest, unnaturally so, when she is looking at herself in the mirror, the most “interior” action she performs while dressing. The sound reminds us of the tiny, birdlike jerkings that the girl made immediately after stabbing the artist. Just after the knife sequence there is another subjective distortion of sound, when a customer rings a bell as he enters the store. We are in the breakfast parlor, and yet the bell resonates much more loudly than it does elsewhere in the film. The camera is on a close-up of Alice’s face to indicate that it is her point of view, once again, from which we hear. One of the elements that Film Studies For Free appreciates most about online audiovisual film studies (film studies in digital video forms) are the phenomenological possibilities they offer viewers for the experiencing of moving image and sound juxtapositions in real time. We can synchronously feel, as well as know about, the comparisons they make. In other words, unlike written texts, they don’t have to remove themselves from film-specific forms of meaning production to have their knowledge effects on us. Embedded above is FSFF‘s homemade example of this kind of simple, more or less medium-specific, eloquence: a real-time video juxtaposition, made for the purposes of scholarly comparison, of corresponding sequences from the silent and sound versions of Alfred Hitchcock‘s Blackmail (1929). It is a work intended to supplement the contribution of an earlier blog entry here, entitled Thrilling the Ears: Sound in Hitchcock’s cinema in which the two sequences were separately embedded. 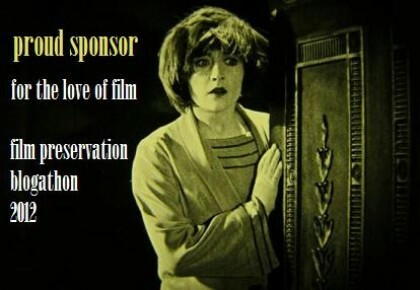 But it is also intended to publicise FSFF‘s support, as ever, for the very relevant For the Love of Film Preservation Blogathon which will take place this year between May 13-18, 2012 . The blogathon has a Hitchcock theme and will support an important film preservation and dissemination project focusing on an early ‘Hitchcock film’: The White Shadow (1923). You can read more about the blogathon below, and much more about it at the linked-to websites. But suffice to say this may not be the last Hitchcockian video study here at Film Studies For Free this Spring! Screencap of a windswept Christian Bale as Bruce Wayne in Batman Begins, Christopher Nolan‘s 2005 regeneration of the Batman film franchise. Read about the reboot in William Proctor’s Scope article. And for Film Studies For Free‘s very own, popular Christopher Nolan Studies links list, try here. Film Studies For Free rushedly points you to some great weekend reading: a new issue of SCOPE is out. Please check out the very worthwhile items linked to directly below. That is all. Thank you. 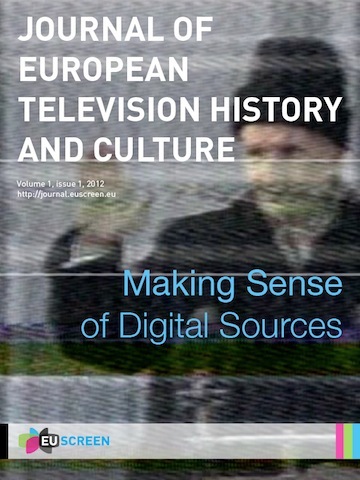 Journal of European Television History and Culture is to be the first peer-reviewed, multi-media and open access e-journal in the field of European television history and culture. It will offer an international platform for outstanding academic research and archival reflection on television as an important part of our European cultural heritage. With its interdisciplinary profile, the journal is open to many disciplinary perspectives on European television – including television history, media studies, media sociology, cultural studies and television studies. If only for pretty sound, nominal reasons, Film Studies For Free doesn’t usually stray too far beyond the field of free film studies. Today is an exception, however, simply because of an exceptional, new, and also free to access, online publication. the complexity of rights issues and the lack of contextualisation of digitised sources. FSFF salutes EUScreen, ETHN, and especially, on this the occasion of its birth, the Journal of European Television History and Culture. It can only hope that European (and, indeed, non-European) archival film culture and studies will learn much (and quickly) from the wonderful and increasingly joined up examples of its televisual counterparts. Anime is a visual enigma. Its otherworldly allure and burgeoning popularity across the globe highlights its unique ability to be more than just another type of animation. Originally a novelty export from post-war Japan, anime has now become a subtle yet important part of Western popular culture. Furthermore, it remains a key area of audience and fan research that crosses all generations – children, teenagers, and adults. From Osamu Tezuka to Hayao Miyazaki, Akira (Katsuhiro Ôtomo, 1988) to Ghost in the Shell (Mamoru Oshii, 1995), anime’s extraordinary characters and oneiric content still enable it to be regarded as one of the most awe-inspiring visual spectacles going into and during the twenty-first century. Film Studies For Free is delighted to announce that the Spring 2011 issue of Cinephile, the excellent film journal edited out of the University of British Columbia, Canada, has just been made available for download for free as a single PDF file. As signalled above, this issue is dedicated to “Reassessing Anime” and it features great, original articles by internationally renowned animation scholars Paul Wells and Philip Brophy, as well as illustrations by Vancouver-based artist Chloe Chan. The issue’s table of contents is given below, and below that, FSFF has also provided a handy, clickable index of its own popular posts on anime and Japanese cinema. The latest issue of Cinephile, available for purchase now, is on Contemporary Realism. It features original articles by Ivone Margulies and Richard Rushton. There is also a call for papers on “The Voice Over”.